While South Korea’s biggest exports are probably Samsung and LG electronic products; Hyundai, Kia and SsangYong vehicles (not forgetting K-pop singer Psy! ), its plastics machinery industry is also beginning to be noticed, said manufacturers interviewed at the Koplas show in Seoul, held 12-16 March. Injection moulding machine (IMM) manufacturers like LS Mtron, Woojin Plaimm and Hyundai Injection Machinery are making headway in the global and Southeast Asian markets. “Malaysia is our largest market in Asia. 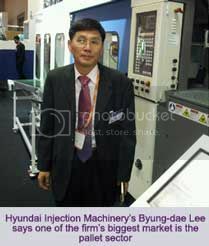 Last year, we sold 450 machines in the country,” said Byung-dae Lee, Production Director of Hyundai Injection Machinery. “We also expect sales to pick up this year in Vietnam, Thailand, Indonesia, Mexico, China and Uzbekistan,” he added. “We sold 300 machines last year and expect to increase to 400 this year,” said Lee, adding that the firm expects a turnover of US$35 million this year. Another machine maker LS Mtron is seeing increasing sales in Southeast Asian markets, especially for its large 3,000-4,000 tonne-machinery for pallets and large containers, said Lee Jong-Hun, General Manager of the Overseas Sales Team. “Last year, we had a turnover of US$20 million and 20% sales from Asia. Our market share for large tonnage machinery has also gone up in Indonesia, Thailand, the Philippines and Malaysia,” he said, adding that this year, the targeted markets are the US, Turkey, Brazil and Russia. Meanwhile, Woojin Plaimm (it changed its name from Woojin Selex last year), had export sales of US$60 million, about half its total turnover of US$120 million, last year, according to Andrew Kim, Regional Sales Manager. “We are already in many countries and targeting the Asian markets through our direct sales offices in India, Malaysia, the Philippines, Thailand, Vietnam and Indonesia,” he said, adding that the firm set up branch offices in Japan and Mexico last year to further expand its thrust in the respective countries. Meanwhile, the South Korean IMM makers have also jumped on the energy savings bandwagon and were propagating hybrid or servo-hydraulic pump-driven machines at the show. “Almost all Korean moulders use hydraulic machines but they are slowly changing to hybrid and electric machines,” said Woojin Plaimm’s Andrew Kim. However, Kim added that all-electrics are an expensive option, hence the growing demand for hybrid machines. 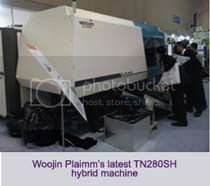 In fact, according to Kim, of the 1,700 machines Woojin sells a year, 60% are hybrids. “This is Woojin’s strength and its main product,” he said, adding that most Samsung smart phone OEMs utilise Woojin’s THS hybrid range. “We sell about 1,000 hybrid machines a year just to the smart phone industry. In fact, almost all the Samsung smart phones are made using the THS hybrid range,” Kim added. The Incheon-based firm displayed the TN280SH hybrid machine, a new model in the THS range, which has been upgraded with a new toggle mechanism that bends from the inside to the outside, allowing for more pressure to be applied to the centre of the mould. “The machine employs a servomotor for plasticising, has a 40% higher clamping speed and wider mould opening distance, but the overall dimensions of the machine are the same,” claimed Kim. But the firm is not content yet. “We are developing the model further to include a smaller machine size with a higher clamping force. This will be launched at the end of this year,” said Kim, adding that the THS model comes in sizes of 50-450 tonnes. Woojin has also improved the TN250E all-electric machine, which has a similar clamping system as the 280S but has three servomotors on the injection side to allow an injection speed of 1,000 mm/second. “Compared to hydraulic and hybrid machines, this model is able to save up to 70% energy,” claimed Kim, adding that the machine is equipped with Austrian firm B&R’s injection drive system and controller. Meanwhile at Dongshin Hydraulics’s booth, it was showing the K700 hybrid machine running the MuCell foam moulding process (licensed by Trexel US to Dongshin in 2001) using two servo-pumps, according to Assistant Manager Kim Hyoung Joon. Besides the part weight savings of up to 20%, the process is touted to allow for up to 50% lower injection pressure and up to 80% reduction of clamping tonnage, said Kim. Another highlight at Dongshin’s booth was the Twifit 650 MC injection moulding machine for large products, which was tagged as a two-in-one machine. This is because it uses a single screw and plunger and has two nozzles to feed two cavities. Hence, when one part is being cooled after being injected, the injection unit prepares the next shot for filling the second cavity, thus saving on production costs, said Kim. 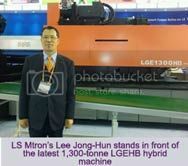 Another machine maker focusing on the use of servo-powered hydraulic pumps to allow for lower energy use is LS Mtron. Of the five machines on display at its booth, two were hybrid models like the LGH850MEIII, which the firm says has two servo-piston pumps allowing for energy savings of up to 50%. “Car makers are reducing costs by using engineering plastics. We have cooperated with OEMs for car makers like Kia, GM and Hyundai to use this machine to make manifolds from nylon,” said Lee Jong-Hun. Another hybrid machine, the 1,300-tonne LGEHB model, was shown undertaking moulding of acrylic lamps and painting in one step, thus saving costs for the automotive sector, says Lee. “We’ve sold 15 units to a Japanese Tier 1 supplier at their factory in China,” he said, adding that the machine is 80% electric since hydraulic actuation is used for the final clamping. Of the 1,500 machines LS Mtron sells in a year, 60% are of the hydraulic/hybrid range and the rest are all-electrics. “We would like to sell more of the electric/hybrid machine range,” added Lee. Meanwhile, Hyundai Injection Machinery was showing the EDIS1000DL two-platen machine (that ranges from 70-3,000 tonnes) as well as EDIS350 and EDIA250 hybrid machines. According to Byung-dae Lee, the firm uses servo-pumps on the EDIS, EDIA and SPE machine range (70-780 tonnes), to allow for energy savings. “We have upgraded the hydraulic range to hybrid with servo pumps and changed the motor speeds as well as with a changeable motor that saves up to 60% energy. The cooling time is also shorter,” said Lee. Lee also explained that to allow for a competitive edge in the market, the firm is producing its SPE small tonnage machine range in China under an ODM license to Guangdong Only Machinery. "We have to compete with Chinese machinery makers in the Korean market, so we import the machines from China and sell them in this market," said Lee. While the firm is targeting the automotive and electronic markets for its small machines it also sells its larger sizes to pallet makers. “Our customers are able to produce pallets with a weight of 45 kg and in a 100 seconds/cycle time, in one step. This is because the compounding is in line,” said Lee. The organiser of Koplas, Korea E&Ex, says this year's event was the biggest with 303 companies. It was paired with Intermold and included companies from 24 countries as well as association representation like the Plastindia Foundation, All India Plastic Manufacturers Association and Taiwan Construction Equipment Manufacturers Association.